We had our first pit, the demo pit, at Saturday’ May Day celebrations. It was, as you will no doubt remember, a fairly wet day. Luckily, so far, the weather forecast for this coming weekend is much better. There is important information in this newsletter for everyone coming. The demo pit was very useful in a number of respects. Although it wasn’ an ideal dig site (being too near trees and their roots as it had to fit in with the stalls, bouncy castle and so on), it did produce a number of interesting finds. The dig was curtailed because of the weather but will be finished this coming weekend. First lesson: The more people that actually help, the easier and better it will be. I anticipate there will be visitors coming out of general interest but it is important to get as many people helping at the pits as possible. If you can do gardening, you can do the Big Dig. Your contribution would be very valuable even if you can’ be here for a full day (although that would be the ideal). The digs proceed slowly as all the earth has to be examined. There is little heavy work. Some jobs like sieving can be done standing or even sitting (if you bring your own chair). 2nd lesson: Although we all want to stop and look at what is found, this does slow down the work at the pits. All the finds will be coming back to the Village Hall to be cleaned. So all of us will have the chance at the end of the day to see what has been found. Furthermore, it is only fair that those who actively help in some way find out the results first. You will all be invited to events we will hold before anything is announced generally. So PLEASE, for each day at the Village Hall, leave your name and email (or phone contact) and say what you did for each day. There will be a register for this as well as a space for you to leave comments. These comments could range from how you enjoyed the day to suggestions for improvements. Please leave enough time at the end of the day to make the site safe and clean the equipment up. At the site please scrape off any earth from the equipment and, back at the Village Hall, wipe everything down. Please don’ leave this to someone else. Perhaps the supervisors and marshals could make sure everyone helps here. So perhaps aim to finish about 3.30 to allow time to clean up although each team can make their own decision. We have changed the plan for ‘ecuring’the site, assuming it hasn’ been finished on the first day. There will be boards (4ft square and ½”thick) to leave over the pit. The tent pegs that were used to mark out the pit to begin with can be put in to stop the board being moved by sheep! Gardening clothes and gloves are essential. An old apron is handy for sieving! With one hand you can hold the sieve against you and use to other to sieve. We will have a supply of rags but if everyone brings a rag or old towel, we won’ need to scrimp. Could supervisors and marshals bring a camera. If they are not needed, they can be left locked in our office in the Village Hall. Generally a spade, secateurs and a trowel would be very handy as well. We have 2 kneeling pads per pit which is probably enough but if you have your own knee pads, you may find them useful. 4th lesson: This was my first dig and in the rain! I still enjoyed it, a lot of us learning as we went on. As it was May Day and the Village Hall not available, we didn’ get to see the finds but at our dig weekends they will be on show for us to see cleaned at the end of the day. It is a chance to enjoy yourself while helping to discover not just Long Preston’ history, but if our hopes are right, a much wider understanding of how life was in mediaeval and earlier times. This will take place on the school playing field on Tuesday 19th and Wednesday 20th May. All the children in the school will take part in the dig in small groups throughout each day. If you are interested in helping on these days, please let me know. You don’ need to be DBS (formerly CRB) cleared but obviously I will need to know who wants to come rather than having these days as an open event. Experience of working with primary school age children may be an advantage. That said, from my own and other people’ experience, you will find the children a pleasure to work with. For all those who would like to be a marshal there will be a meeting this Wednesday at 7.30pm upstairs in Long Preston Village Hall. This will be an important role. The pit supervisors know what to do with the technical side of each dig pit. I see the marshals as helping in this and beyond. This is helping at the dig site in whatever capacity is needed plus making sure everyone is constructively involved, explaining what is happening to visitors and so on. I will be explaining at the meeting how the pits will be dug and why, where and how everyone gets onto the sites, what needs to be done and when. FINALLY, I look forward to seeing as many of you at the weekend as possible. Meeting times : please arrive by 9.30 each day at the Village Hall when the briefings will start. The dig weekends are getting near so it’ time to confirm the arrangements that you need. There will be a demonstration dig on SATURDAY 2 MAY. This is going to be at Long Preston’ Mayday celebration which has Maypole dancing starting around 12.30. Stalls and our Dig will be on the Main Green (behind Rohan and next to the Village Hall). Please meet in the Village Hall at 9.30. We plan to start the digs at around 10am. Don’ be nervous about coming. There will be lots of abilities and ages. Also there is a wide variety of jobs and scope to drop in and out. We will all try to make sure everyone enjoys the event. Please note the digging is really a small part of the archaeology. The pits are only one metre square and we will be going down slowly at 10cm tranches. The earth at each level will be checked first for any finds, then loosened and sieved to make sure nothing is missed. Any finds will be taken back to the Village Hall to be cleaned, bagged and labelled. Kneelers will be provided as will all the equipment except for the following. Anyone who wants to be at a pit should be suitably dressed for whatever the weather holds and have gardening gloves. Also please bring a spade and secateurs. We may not need them – we won’ know until the day. I have some volunteers. There is room for more. These will be the people who will have a varied and important role. You will be dealing with the visitors, explaining the dig and showing people where to go. You will also be helping out wherever help is needed. If you want to be a marshal, I will be holding a meeting in the VILLAGE HALL (the upstairs room) on WEDNESDAY 6 MAY at 7.30pm. It is not essential that you come but it is highly recommended. I will be explaining how each test pit will be dug (the how and why), what the various roles of the volunteers will be at the pit and in the Village Hall, the plan of how the digs will progress through the village and your roles in all of this. As a marshal, you will be making sure the project goes smoothly, so really need to know what is involved throughout. The Methodist Chapel has a small car park for SATURDAYS ONLY. This is behind the Village Hall. However there is plenty of parking at the station. To find it, as you come from Skipton, come up the hill and take the first road on your left. From the Settle direction, it is the first road on the right after the Boars Head pub and about 6 houses. It is a 5 minute walk to the Village Hall. As you leave the station car park, turn right (the way you drove down) and cross the road. Between the last field and the first house is a footpath. Take this and at the far end – a squeeze style – go straight ahead to a small triangular green and the Village Hall is on the opposite corner . You will see a pebble dashed newish build – the snooker room annexe. Firstly we have a volunteer, Roger Taylor, who will be photographing the event as a digital record. Secondly, at each of the dig sites, there will be regular photographs of the dig proceeding and any finds. The dig supervisors have been asked to bring their own cameras for this but anyone who wants to be at a pit for the weekend can also bring their camera and take on this role. You would need to supply us with a CD (to be provided) of the photos and sign a copyright waiver so we can use the photos as we wish. Three village groups are providing lunches in the Village Hall on the Saturdays. On 9 May it is the ‘ethodist Chapel’who will be selling sandwiches and cakes. On 16 May it is the ‘ver 70s’who will be selling sandwiches and cakes. On 23 May it is the ‘laygroup’who will be selling (I think at this stage but to be confirmed) pizzas. As I said before, tea and coffee will be available throughout free of charge so I hope you can support these groups with their fund raising efforts. On the Sundays, as well as the Saturdays, there are still the 2 pubs, the Boars Head and the Maypole, as well as the village store who sell a selection of hot sandwiches etc. I have not been spoilt for choice here! I have a potential for the last 2 weekends but still would like volunteers for all the weekends, certainly the first one. If you do have a current certificate and want to volunteer, please contact me. I hope you will not be called upon! We are hoping to find evidence of an Anglo-Danish settlement. If we do, it will be of national significance! Whether you are the person to actually discover the finds, the person who cleans them, one of the helpers – it doesn’ matter. You will be part of the team and it will be OUR DISCOVERY. The Heritage Group will be producing a book and I would like everyone who has participated to be recognised in this book. At the Village Hall there will be an opportunity for you to leave your name, etc so you can be included. Please sign up, say what you thought of the Dig and be a part of the project. WITHOUT YOU, this project will not happen. Long Preston Heritage Group (LPHG) is planning to carry out an archaeological dig in Long Preston over 3 weekends next May 2015. This type of dig has proved successful around the country as evidenced by Time Team. 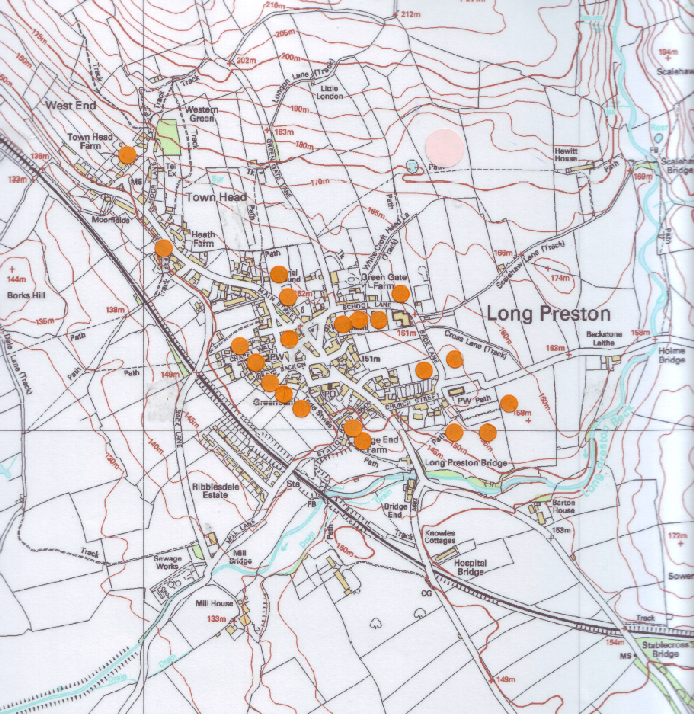 The aim is to see if we can find the reasons why Long Preston started where it did including whether there is any evidence of Long Preston being once an Anglo-Danish village. LPHG have been researching the idea for some time and have already got active academic support for the idea. This is from Dr Carenza Lewis of Cambridge University (who used to be on Time Team) as well as Chester University Archaeology Department. The digs would be lead by Dr David Johnson who lives in Settle and who has already conducted successful digs around Ingleborough uncovering Anglo-Danish farms and farmsteads. Carenza Lewis will be coming to Long Preston to give a talk in December. Virtually all village digs have taken place in the south or south east of England. However archaeologists are only now realising they are missing major parts of Britain’s story in that they simply do not know for definite what happened in most of the country. This is why there is such interest in a dig in Long Preston from the various universities. What we might find may throw new light on not just how Long Preston started but how and when the Anglo-Saxons settled throughout England. Each test pit will have a trained supervisor and will be about one metre square going down to say one metre max. Proper health and safety considerations will obviously be met. Long Preston will see a lot of activity next month thanks to a grant from the Heritage Lottery Fund. The village is recorded in the Domesday Book of 1086 but the Long Preston Heritage Group wanted to see if evidence of an earlier settlement could be discovered. Last December Dr Carenza Lewis (formerly of Time Team) gave a talk to 85 people in the village hall to illustrate the possibilities of finding a pre-Conquest settlement. As a result more landowners and residents were inspired to make sites available for 30 tests pits to be dug. With Dr David Johnson as the lead archaeologist, a successful bid was made to the Heritage Lottery Fund in January; without its help this project could not go ahead. So work on the ground begins at the start of May. A sample test pit will be prepared on Main Green as part of the village’ May Day celebrations on Saturday 2 May so that villagers and visitors can see what is involved. Then the Big Dig takes place throughout the village on the following three weekends (9/10, 16/17, 23/24 May) with a series of 1 metre square pits. Not only does this new project have the potential to add to our present knowledge but it is also supported by many of the voluntary groups who will be providing refreshments in the village hall over the Dig weekends. please contact Ian Evans on telephone number 01729 840505 or email gigreencot@gmail.com . Or just come and see us on any of the Dig days. The main 3 weekends are the Saturdays and Sundays 9/10, 16/17 and 23/24 May. (The 23/24 May weekend is the Spring Bank Holiday weekend). you can commit to and your mobile number. The digging part of the project has now been completed but it will take several months to analyse all the finds. Not least because, from the pits 1 to 30, we have 2893 individual finds, not including charcoal. The remaining 4 pits will push this total to well over 3000. The last 3 pits were dug on Wednesday 5 August. So far 1134 finds numbers have been allocated. This is a lesser number than the total, as, out of 2893 individual finds, some could be grouped together. For example, one finds group has 63 pieces of the same type of pottery in it so that qualifies for only one find number. 4 pits had prehistoric lithics (ie worked stone). Prehistoric in this context is anything earlier than AD70. 5 pits had finds from the Roman period, AD70 to AD410. These were 4 pieces of pottery and one of glass. 3 pits were by the church, one on the opposite side of the Village Green in Chapel Walk and one down Station Road. 25 pits had mediaeval or immediate post-mediaeval pottery, ie from 1066 to around 1500. 6 pits had 16 century finds. I don’ have the information yet on post 16 century finds but would presume most if not all pits would have these. These results do not include clay pipes or charcoal. You will notice there is a gap from the end of the Roman period to 1066. The problem is that in this period, pottery was not produced in the North West as people used wood and iron more. These are much harder to find than pottery. Our experts no doubt will know how to resolve this gap! Four items have been sent up to Durham for conserving; the timescale for their return is not yet known as they have to take their turn in the lab. The charcoal has to be sent to a lab so that we can ascertain the species of tree. Once that has been done, we can select which will go for dating. Some tree species are too long living so would give a too long time frame. We will be using dated charcoal from the earlier / deeper contexts to help source information on associated finds. 1. A Pottery Processing Workshop. Once the finds have been fully analysed (probably late autumn), we will need to count and weigh the finds and date the clay pipes and stems. We need to do this so that we can ‘eight’the information. Volunteers will be invited to a workshop in the Village Hall. 2. The Heritage Group’ AGM. This will be on 15 October and will include a talk by David Johnson updating us all on the Big Dig and, also, a talk on a new HLF funded project Under the Uplands by Nigel Steel of ‘igventures’ This is not one of our projects but a new archaeological project to explore a cave above Settle. The headquarters of the Dig will be Long Preston Village Hall. Unless said otherwise, this is where everyone should meet. Start time is 9.30 so the actual dig can start at 10am. There will be a demonstration dig on Main Green (this is the large green next to the Village Hall, behind the Rohan shop) on Saturday 2 May (finishing on the Sunday). This will be part of Long Preston’ annual Mayday celebrations which has the schoolchildren dancing around the Maypole and other entertainment. Everyone is invited to the celebrations and we would like a limited number of volunteers to help with this dig. Please let Ian Evans ( see above ) know but, as there is only one pit, do not just turn up to help. There will be occasional mid-week digs involving school children; dates to be finalised. Again volunteers are welcome; contact Ian Evans - see above. On each day, for supervisors, diggers and marshals, there will be a list of contact telephone numbers to get in touch with archaeologists, first aiders, etc. Supervisors will be leading each dig site and have previous archaeological dig experience. Seminars have been arranged for them next week on 13 April or 17 April at 7.30pm. However there are spaces on both seminars for other volunteers who want to know more about how each pit will be dug. This might be good for anyone who wants to be a marshal (see below). Contact me please for more information. This is an essential job and I am looking for volunteers. Your role would be to get the right people to the right place and to show and explain to visitors what is happening. You would also need to make sure everyone can safely enjoy the event. You will also be liaising between the people at the pits and the archaeologists, etc. Marshals will probably need to know the layout of the village. I will be arranging a seminar to train everybody up (one during the day and one in the evening probably). If anyone has a current qualification and wants to volunteer, could you please let me know. I will need to know as well what days and times you can commit to and your mobile number. Obviously everyone should be suitably dressed. If you want to help in the digging, gloves and knee protectors could be useful as well. Spades – as these are common, it seemed silly to buy and store them, so could diggers and supervisors bring one. I suspect most will be able to be left in your car boot. Digital cameras – there will be regular photography of each pit and its finds. Can all supervisors supply their own please If anyone hasn’ got one or can’ bring one, please let me know. Tea, coffee and biscuits will be available free of charge in the Village Hall throughout the main dig days. LPHG members especially are invited to help to keep everyone supplied. For those who don’ how to find our Village Hall. Coming from Skipton direction, go past the Boars Head pub on the left and about 100 yards further on, you will see a Rohan shop also on the left. Turn left before Rohan and the Village Hall is about 100 yards on your left. It will have a Big Dig sign outside. Coming from the Settle direction, the Rohan shop is virtually opposite the Maypole pub (indeed it used to be where coaches and horses were stabled). Turn right immediately after the Rohan shop and, again, the Village Hall is just down on your left. Village voluntary groups are being asked if they want to offer simple lunches but there are also 2 pubs (Maypole and Boars Head) and the village shop which sell food. When I have more information on refreshments I will let everyone know. This is separate to the (technical) photographs taking place at each dig site. I would like a digital record of the event. This would cover not just the actual digs themselves but the general happenings. I have 2 names of people who might like to do this but are there any more? If this is your hobby, please contact me. All photos would have to be made available to Long Preston Heritage Group (LPHG) without copyright to use as we see fit. Credit will be given. As well as a technical report of the Dig being prepared, LPHG will be producing a more general book. I would like everyone who has participated to be recorded in this book (name only) so please give your name and address when you come to the Village Hall. Most of these are on private land. The owners and/or tenants have willingly allowed the Dig to take place. Please therefore respect their property and, if you see for example a visitor climbing a wall, please stop them or contact a marshal. The plan is to group the dig sites together as much as possible. We plan to start by St Mary’ Church and work down School Lane to the village greens and finish in West End by the third week. I attach a rough plan of the dig sites, the same as in the previous newsletter. We will be out and about on Saturday 11 April to determine (and mark) the actual dig sites. Larger scale maps will be prepared of the sites afterwards. Once again, I and Long Preston Heritage Group would like to thank you all for your interest and support in bringing the project to this stage, now so close to beginning. I believe this support was a major consideration to the Heritage Lottery Fund’ decision to award us the grant. We look forward to meeting you at the Digs and we are working to try and make this an enjoyable and rewarding experience for everyone. The Big Dig has been much more successful than we had anticipated. This article will update you all on our results so far but we have just dug 4 more pits on the weekend of 4 and 5 June to clarify and/or confirm some of our results. Our archaeologist, David Johnson, has obtained results from analyses of the finds in the pits (although still on-going) and has the radiocarbon dates back. 21 of the 34 pits dug were disturbed meaning that lower contexts contained material from different periods so none of it can be deemed to be secure dating evidence. However every one of these pits still contain finds which add to the overall picture. In some cases the pits add a lot of useful information. Of the remaining pits, 6 pits are all definitely mediaeval and 2 of these have radiocarbon verification. 2 more pits are probably mediaeval. 1 pit is either Roman or mediaeval in its lower levels although the radiocarbon date from it showed mediaeval. 2 pits are 17th century in their lower levels. There are also indications of Neolithic or Mesolithic activity as well (4500 to 11,000 years ago – not bad when one remembers this is back towards the end of the last Ice Age). The time span is wide as the stone flakes found are fire damaged and therefore the cut of the stone, their style and therefore their period, can’ be accurately determined. A lot of the stone flakes found seem to have been burnt in a fire which would mean the working was done nearby. (These were found in Hilary Baker’ garden which was the one dug on Chapel Walk, closest to the Main Green). Other lithics found elsewhere also indicate Neo/Mesolithic activity. Failed – 1 although another sample has been sent off for analysis. Of the silver found, the half-coin, is (using jargon) a silver "voided long-cross penny" cut in two to make a half-penny. It dates to the reign of Henry III between 1247-72. The spoon is a silver teaspoon bowl probably of the 18th century. Both of these need reporting to officialdom under the Treasure Act, but there is no booking of a world cruise on the proceeds! Both these items were found in Hilary Baker’ garden as well. We also are planning sometime for a ’pottery workshop’ As the analyses are still on-going and, because we now have a further 4 pits to dig, it is sensible to wait until they are done. Therefore we can’ yet set a date for the workshop yet (amongst other things, to weight the pieces of pottery so we can take into account the correct amount, not just by numbers of shards found). I am pleased to say the Heritage Lottery Fund have now given us permission to proceed to the Full Bid. The next meeting to allocate grants won’t be until the middle of March 2015 which is not much time before the actual digs which are being planned for May. I also need to say that LPHG has already had 2 HLF grants, the last one just finished, is our World War 1 project. The HLF has said that the Big Dig funding application has to be a completely different venture from those already awarded, with an implicit concern therefore that we might be too successful! This has been anticipated which is why, in part, we have been wanting to extend the project as widely as possible beyond Long Preston so as to offer the experience to as many people and different groups as possible. The full bid will be worked up over Christmas 2014 for submission in early January 2015. I am also pleased to say that Carenza Lewis’ talk on up here was a success – not just for the entertainment and interest value of the talk itself but also for the response from the audience. Following on, with regard to digging sites, all the ones we feel are essential as potentially having the most to offer, have now been agreed. However a big dig is nothing if we don’t get as wide a spread as possible and this too is happening. All the sites are important and all will be dug with the same attention. With the volunteers and interest we already have plus the sites, the project is ready to go. However it does all depend on the grant. It may be a surprise to you, it certainly was to me, that the anticipated costs are over £20,000. We have to pay for the actual materials to safely dig and do the archaeology as well as the technical support from Chester University, pottery experts, workshops and so on. We also have to make an allowance for costs of conservation and analysis of finds as well as producing a technical report and a more general book on what we have found. We will have to be positive about getting a grant and prepare for the project in advance of the decision. Some of this will be done by outside experts. For example Chester University will be doing a Lidar analysis. Lidar is an aerial laser ground survey which can be analysed to enable a number of surface features to be seen that are not normally visible. They will also be producing a GIS, a Geographical Information System, of the area which is an interactive survey enabling us to see patterns and features not generally visible. We will be organising workshops to prepare the volunteers (although site training at each dig site will also be given) as well as having all the ancillary things ready fro a successful dig. Finally I would like to wish you all as happy and peaceful 2015 as possible and a big thank you for all your support without which we wouldn’ have got this far.